Fast Hands This is a game for learning English focusing on vocabulary items. You listen to the sound or read the word and then click on the matching pictures. It’s really easy, fun and hopefully a great way to learn and review words. 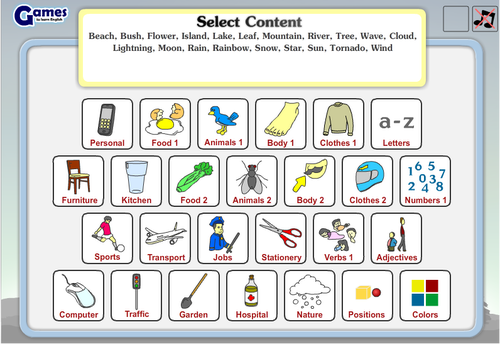 You can choose the content you want to play with and there are more than 500 vocabulary items in total. First you click on ‘fast’ and then select you vocabulary category. Then listen or read the word and click on the matching picture. The game finishes when the time bar at the bottom runs out. But you get extra time added each time you correctly click on an image. The timer goes faster and faster so you need to have fast reflexes. The same set of ten items will repeat endlessly and you can increase your score with each correct hit. However there is a count down timer that is always decreasing. You get additional time with each correct vocabulary word but the speed of the count down increases constantly so eventually you will run out of time. The challenge is to get as high a score as possible before the game finishes. There is a high score table at the end which shows the top players and where they come from. At the first screen you get two options either ‘fast’ or ‘slow’. There are the same game only the speed and possible score is different. Leave a comment below in any language you like. Comments need to be approved by me first due to excessive spam and offensive postings.